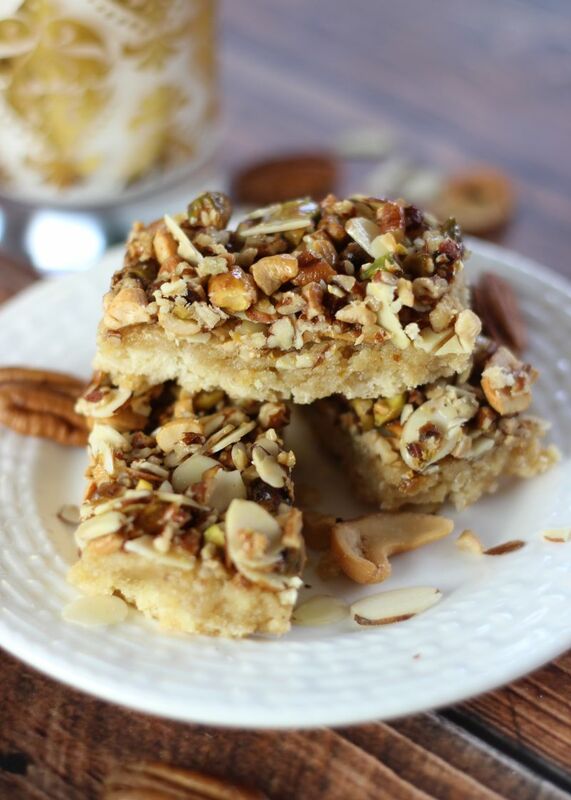 A buttery shortbread crust is topped with a mix of pecans, almonds, cashews, pistachios, and a whole lot of honey! 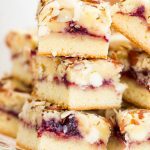 Something about these bars holds a Christmas-y vibe for me, but you can make these anytime of year, of course. 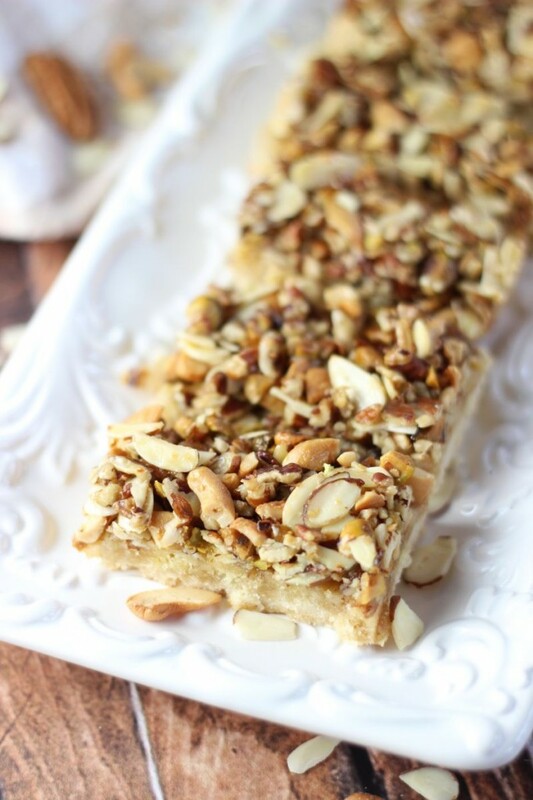 Starting off with a shortbread crust, and topped with a honey-nut topping, a big part of the beauty of these bars is that you can mix any combination of nuts under the sun. You could use any number of kinds of nuts you’d like, and any combination. Mixed with a syrup of honey and brown sugar, you really cannot go wrong. 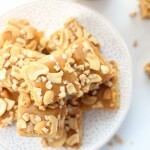 They’re drenched in that sugary stuff and then poured over a shortbread crust. 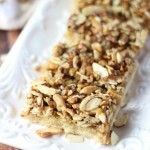 They’re kind of like pecan pie bars, but with mixed nuts, and with honey. 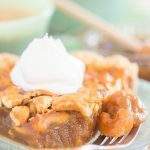 The crust is a little crunchy, but flaky and buttery, and the toasted nuts are sweet and… well, nutty. I’m not gonna lie to you, they’re messy to eat. It’s not the neatest bar cookie to enjoy since the nuts want to topple every which way, but they are so good that you really don’t care. It almost adds to the enjoyment of them because they feel so loaded with delicious honey-coated nuts. We made a significant dent in these bars before they’d even fully cooled from the oven, and they didn’t last long after that. 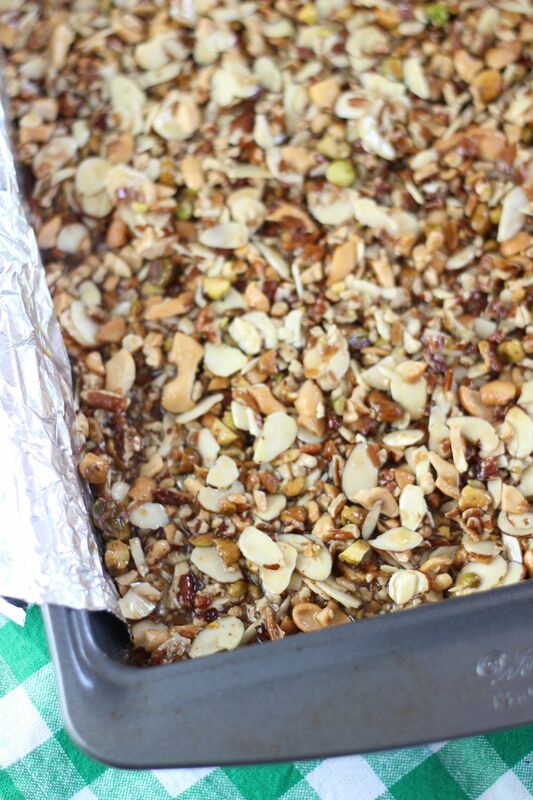 Good news – they are simple to make, and you will never tire of the endless combination of nuts you can choose from! 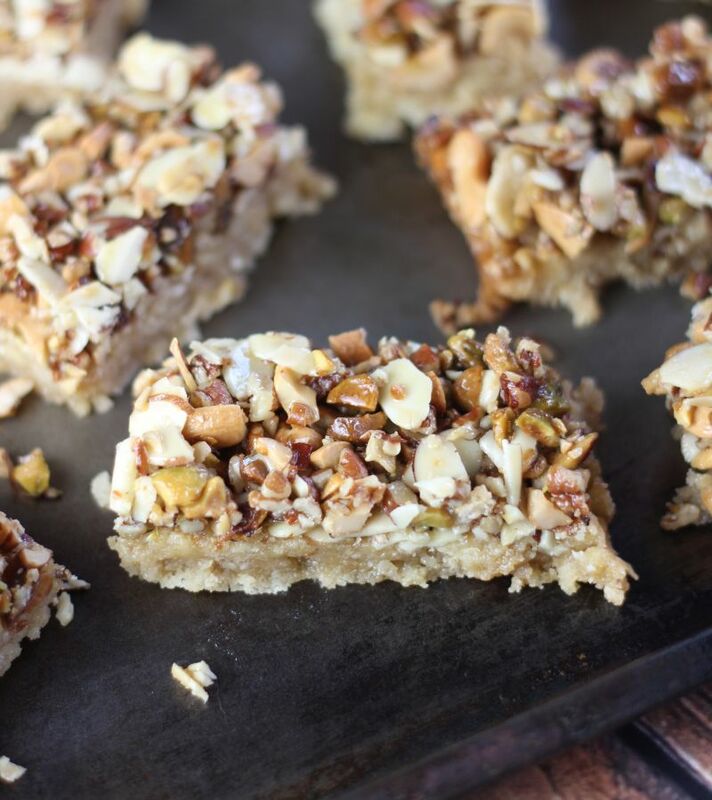 A buttery shortbread crust is topped with a mix of nuts and honey. Line a 9x13 pan with aluminum foil, and spray generously with non-stick cooking spray. 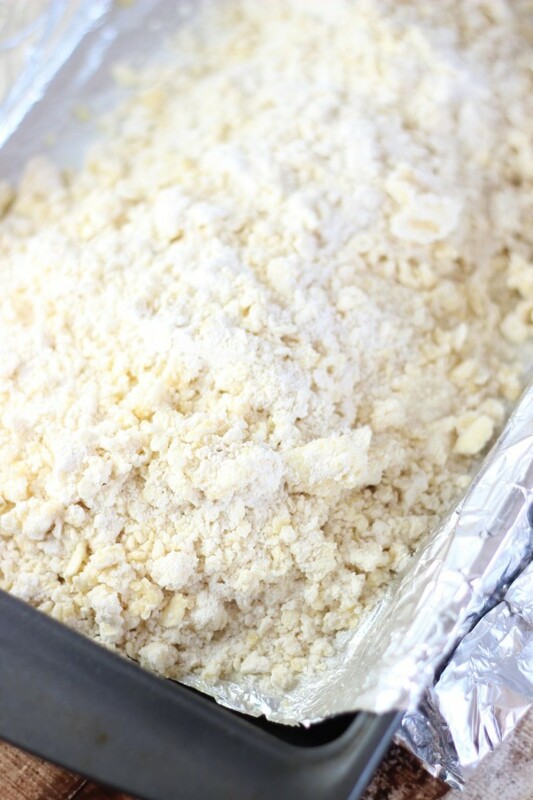 Grate the cold butter into the flour mixture, and mix until it resembles coarse crumbs. Stir in egg until just blended. Bake at 375 degrees for 18-20 minutes, or until edges are golden brown. 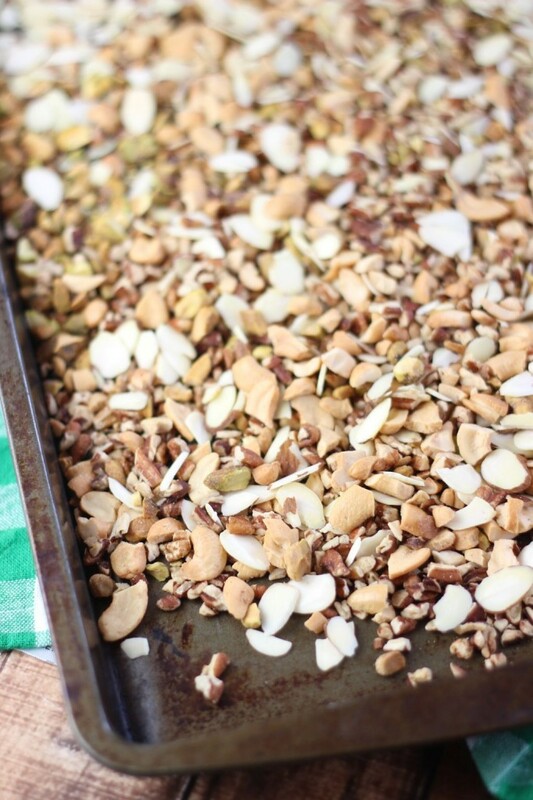 Spread nuts out on a large baking sheet. 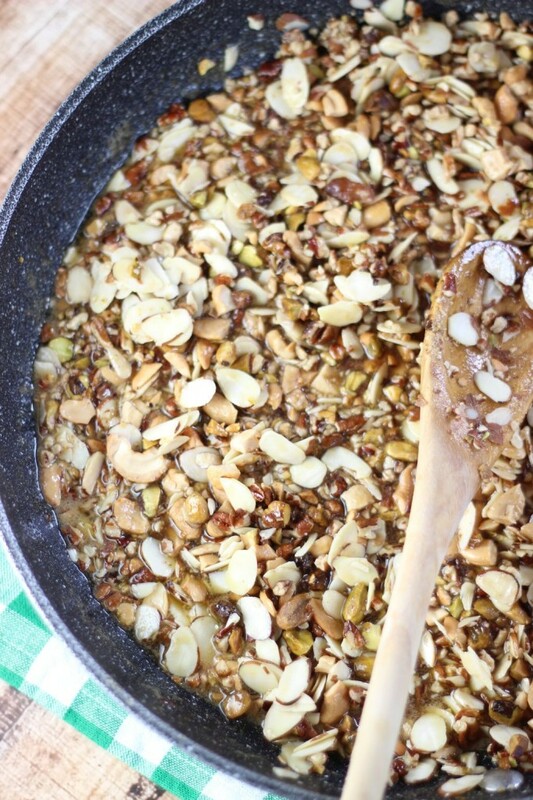 While oven is still heated to 375 degrees, lightly toast the nuts for 3-5 minutes. Set aside. In a large saucepan over medium heat, combine the honey and brown sugar. Stir occasionally until sugar is dissolved and mixture comes to a boil. Boil for 2 minutes without stirring. Add butter, bring to a boil, and cook for 1 additional minute. Remove from heat and stir in the nuts. Bake at 375 degrees for 15-18 minutes, or until topping is bubbly at the edges. Run a knife around any edges. Using the foil, carefully lift the bars out of the pan. 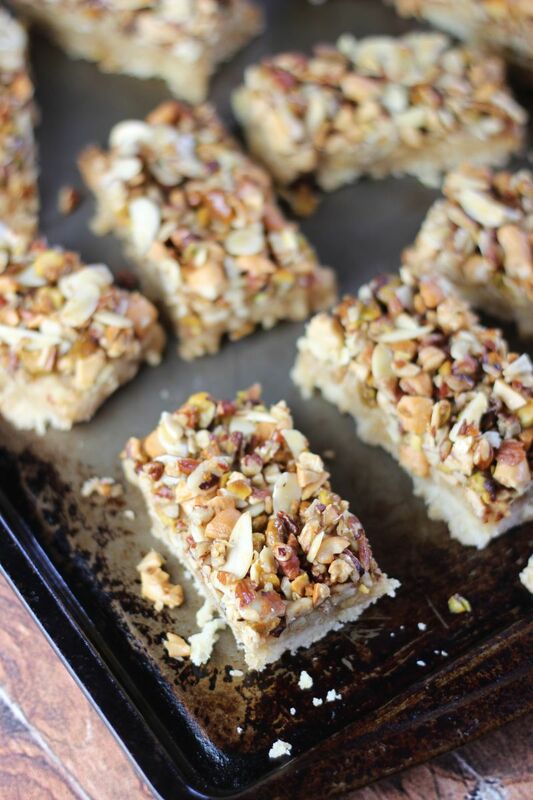 Cut into bars, and discard any foil. Enjoy! These wouldn’t last long at our house either! 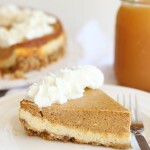 Love the nutty crunch with the buttery shortbread crust! 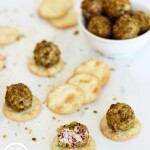 Your recipe is being featured tomorrow at the Inspiration Spotlight Party. Fabulous! I’m actually drooling after looking at your gorgeous pictures. =D Thanks so much for sharing with us at Weekend Potluck.